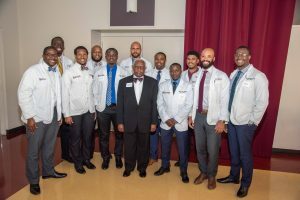 Meharrians past and present gathered for the 143rd Convocation of Meharry Medical College, opening the 2018-19 academic year. The event is an annual ceremonial assembly to mark beginnings, thank scholarship donors and recognize successes. Earlier at the college’s Donor Recognition Breakfast where providers of scholarships meet the students who receive them, it was announced that the college has awarded more than $2.5 million in scholarships this academic year. Convocation speaker Jeanne Craig Sinkford, D.D.S., Ph.D., D.Sc., FACD, senior scholar in residence in the American Dental Education Association, and professor and dean emeritus at Howard University College of Dentistry told attendees in The Cal Turner Family Center for Student Education ballroom about changes in her field of dentistry and in medical and dental education, and how those changes would affect the careers of the students in the auditorium. 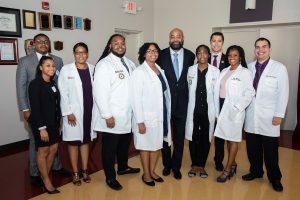 “New discoveries make us realize that dentists no longer own oral health,” Dr. Sinkford said, making the point that medicine and dentistry are interconnected and health care is collaborative. 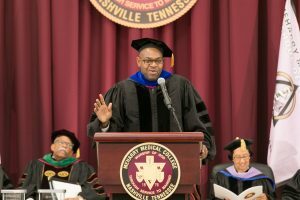 “I’d like the students to know that Dr. [Marcus] Welby is dying,” Dr. Sinkford said, referring to the popular 1970s TV show about a general practitioner. She said the isolated physician in single private practice is being replaced by new care models that have more shared responsibilities. 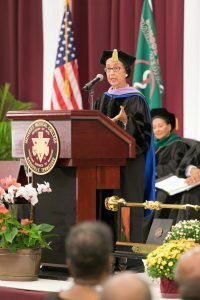 Dr. Sinkford, a 1958 graduate of Howard University and the first woman dean of a dental school in the U.S.—also at Howard from 1975-91—said she is heartened by the fact that women now play a major role in health professional schools with 50 percent or more of the enrollment. 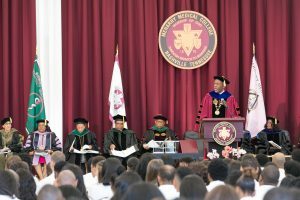 “It’s wonderful for me to see…When I was admitted, they let us know they didn’t want us.” She pointed to the fact that all three of Meharry’s deans of the schools of medicine, dentistry and graduate studies are women. The Harold D. West, Ph.D. 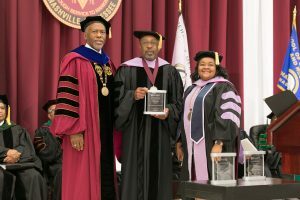 Distinguished Biomedical Scientist Award from the School of Graduate Studies and Research was presented to Dr. James Eric McDuffie, Ph.D. ’98, who, among his many accomplishments, is a renowned toxicologist in the pharmaceutical industry. The Fred C. Fielder, D.D.S. 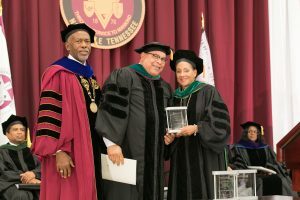 ’60 Distinguished Dentist Award was given to Henry L. Young Jr., D.D.S. ’87, MS, FADI, an attending dentist at MetroHealth System’s Department of Dental Medicine in Cleveland, Ohio and former chairman of Meharry Medical College School of Dentistry’s Department of Operative Dentistry. 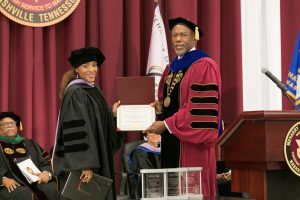 The college also honored Valencia P. McShan, D.D.S., assistant professor in the Department of Restorative Dentistry with Meharry’s Distinguished Exemplary Teacher’s Award.